Saraki defection: Now is the auspicious time to liberate Kwara – Lai – Royal Times of Nigeria. 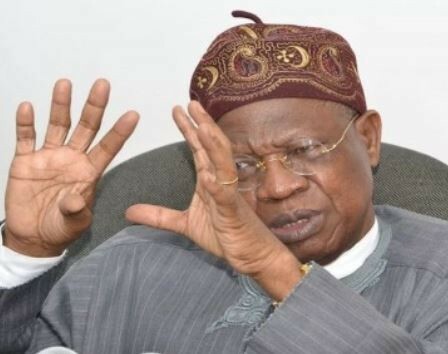 Nigeria’s Minister of Information and Culture, Lai Mohammed has said that the recent defection of President of the Senate, Bukola Saraki and his followers from the All Progressives Congress (APC) had presented an opportunity for the people of Kwara state to liberate the state from those who had held it to ransom. The minister, who spoke at a meeting of Congress of Kwara Progressives also said his mission as new APC leader in Kwara is not to contest any elective position in 2019 but to rescue the state from those he described as hawks. Speaking in Ilorin, the state capital, the Oro-born politician said, “What an auspicious time for all of us! Never before, have we had a great opportunity like we have now to take our state back from the rapacious few, who have held the state by the jugular and prevented it from meeting the hopes and aspirations of its people. 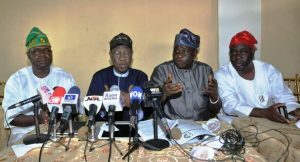 (From left), APC Caretaker Chairman, Bashir Bolarinwa; Minister of Information, Alhaji Lai Mohammed; Labour Party Chairman, Mumuni Onagu and immediate past PDP Chairman, Akogun Iyiola Oyedepo at the political event. “I can tell you that if we all remain united, we can’t and we won’t lose the looming battle for the survival of our dear state. “The people of Ilorin should know who their friends are. I do not hate the good people of Ilorin,” he said. “They will do this and many more acts of blackmail to divide us, to drive a wedge between us. Don’t let us succumb to their antics,” he said. “Never again will our people be turned to panhandlers; never again will our people be made to eat crumbs from the master’s table.